Oil can be both a job creator and a job destroyer. It’s the nature of a boom-and-bust beast, and lately the beast has been a destroyer. As tight oil production from shales has ramped up in a drilling frenzy over the past few years, U.S. oil has disrupted the global market pricing equilibrium and consequently oil prices has been in free fall last summer. They’re down now about 60 percent since June. Not surprisingly, the companies involved in shale extraction—or fracking—have suffered. One result of their pain is that they’ve slashed their capital-expenditure budgets for 2015. They’ve also announced layoffs. Big ones. Oil field service giants Schlumberger and Baker Hughes have said they are axing about 16,000 jobs between them. BP has announced 3,200 layoffs. And the Dallas Federal Reserves is estimating that the state of Texas alone, as a result of the oil-price collapse, will probably lose about 125,000 direct and indirect jobs in the oil sector. One state, 125,000 jobs. Bloomberg News was out just hours ago with a timely bit of reporting around just this topic, painting the energy industry as “the ‘frenemy’ of the American worker,” but the piece is misleading in one crucial respect: it’s the fossil-fuel industry that is the frenemy of the America worker. The new energy economy is the friend of the American worker. These numbers on oil-field layoffs are especially brutal in how they impact families, households and communities. But of course the oil industry is like that, bringing boom and then bust, historically a short-term party followed by a longer period of austerity. It’s an inherent quality of the oil and gas industry because it is at the mercy of the vagaries of international commodity market pricing. Nowhere does it say, however, that energy markets have to ride a perpetually stomach-churning rollercoaster. Renewable-energy technology is the ticket here, and if you look at, say, solar technology and its impact on jobs, a very different pattern emerges—one that reflects the worker-friendly part of new-energy economy. Just last year, the solar industry created more jobs than oil and gas combined. The evidence is laid out in a new report from the Solar Foundation and George Washington University that counts 31,000 new solar-industry jobs in 2014, a 21.8 percent growth rate over 2013—an expansion that was almost 20 times the job-creation rate across economy as a whole. To put this number in energy-industry perspective, solar-industry job creation beat oil-and-gas jobs, including all pipelines, almost two to one. 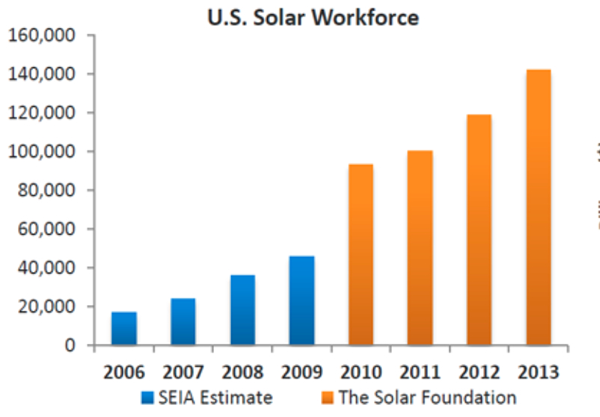 The U.S. solar industry now employs approximately 174,000 people in the U.S. When I first started tracking this number mere three years ago there were about 183,000 jobs in total for wind, solar and geothermal combined. What a difference three years has made. But the takeaway here is that solar energy—like its cousin wind-power energy— is a technology, not a fuel, and technologies typically become cheaper with scale and time. And they are not subject to the vagaries of commodity pricing, because they have no fuel cost. Policy makers who want to create and sustain long-term, good-paying jobs would do well to promote solar and wind over oil and gas. The math makes the case, demonstrating economists might call a virtuous circles in the renewable energy industry. As prices fall in renewables, more people want the product, more jobs are created. Significantly more. The oil-and-gas industries are different. We can create new jobs in oil and gas only if we have concomitant higher prices in the overall economy, including higher energy costs. It’s a dichotomy that ought to start driving public policy: the oil-and-gas industry creates jobs when energy prices, and inflation, rise—while renewables create jobs when energy prices, and inflation, fall. Do we really have to scratch our heads on this? Deborah Lawrence is an IEEFA energy-industry consultant.